Prev iously well known for many years as Seahawk Sailing Belize, Stephen Wright bought the company in year 2000 to rename it Blackhawk Sailing Tours. Since this time, Blackhawk Sailing Tours is always making your trip in Caye Caulker unbelievable. We provide individual private trips, group trips or special offers (weddings) to our guests. The sailing boat is perfect for any type of travelers, which includes families with little kids or senior travelers. 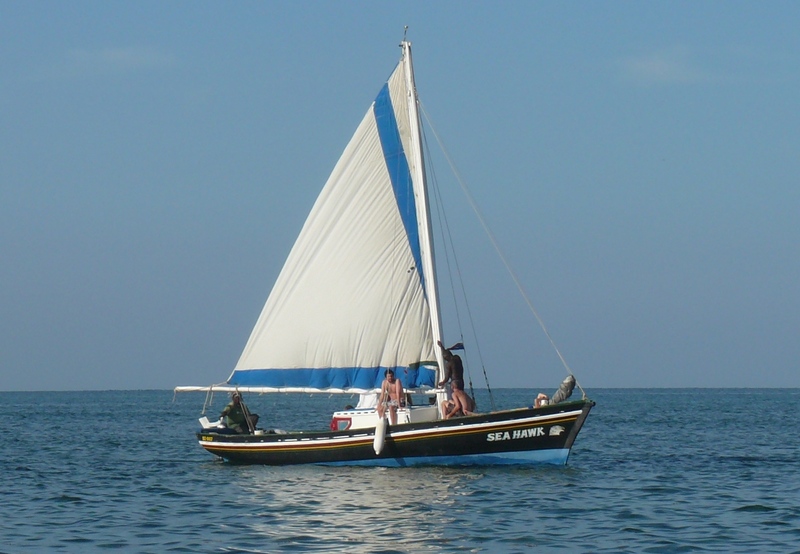 The sailing boat is easy to get on, provides very comfortable ride, has a cabin that fits about 8 people and plus has a small toilet on board. You can choose from variety of different trips such as snorkeling, fishing, sunset cruise and island hopping. All of our snorkeling trips are made to the second largest barrier reef in the world, the Belizean Barrier Reef where brightly colored fish dash in and out of the coral labyrinth under the crystal clear blue green sea. Our snorkeling trips are made to the Hol Chan Marine Reserve and to Caye Caulker Marine Reserve. Stephen Wright, called “Big Steve” by his friends, will be your captain and tour guide for your snorkeling trips to the reef on his sailboat. Stephen and his crew will make sure that you will have the best experience and fun in the tropical seas of Belize. When you go with Blackhawk Sailing Tours, you will be wined and dined on board and personally accompanied to see the nurse sharks, colorful fish, playful sting rays, turtles, manatees and variety of different corals. You will spend a day off the coast of Caye Caulker, with the island sparkling in the distance, rolling with the sea to the beat of reggae music, enjoying the sun and the underwater world. By the end of your trip, Big Steve will probably be a friend you will never forget:)!